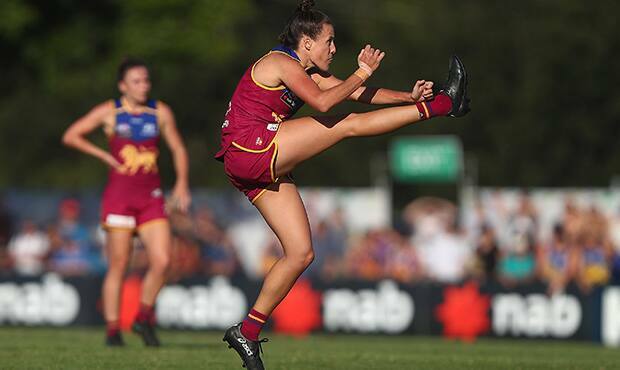 The Brisbane Lions have won the AFL Player Association's AFL Women's Player of the Week award for the second week in a row, with Captain Emma Zielke taking the Round 3 honour. Zielke collected 13 disposals, made eight tackles and kicked a goal as the Lions held off a surging Collingwood side in their first home game for the AFLW season on Saturday. Zielke follows on from teammate Tayla Harris’ outstanding effort against Fremantle in Round 2. The 28-year-old priority pick had an interrupted pre-season but has steadily emerged as a key cog in the Lions engine room. After being named as the Lions’ best player in the four-point win, Zielke spoke to Aflplayers.com.au about her Round 3 performance. “That was definitely the best game I’ve played this year. I had an interrupted pre-season, I had four weeks where I couldn’t run because of a broken foot, so I think my fitness is showing improvements,” said Zielke. “I was happy I could build on some defensive pressure in the second half. I feel like I’ve been getting better throughout the last three weeks. “The longer the game went on, I the more momentum I gained. I tried to get myself into the game defensively, so I tried to lay a few tackles and I thought that really brought me into the contest. “I thought my defensive pressure was good, getting on the move around stoppages helps when they’ve got such a dominant ruck and I worked myself into the game that way. “The coaches were happy with how I finished the game and mentioned how I stepped up my defensive pressure in the last quarter when we were trying to hang on while the Pies were coming pretty strongly. “If I’m playing better, my talk is usually better on the field so that also helps my game as a leader. “We’ve got a good midfield where one of our players is quite attacking, so I find myself more defensive. Laying eight tackles was a big positive for me and I pride myself on the defensive aspects to my game and bringing other midfielders into the game, and I’m also working on spreading faster from the contest and wouldn’t mind getting onto the end of a few chains. The AFLW Players’ MVP Award will be presented at season’s end.